Let’s take a look around the garden this week, shall we? This purple tomatillo is just about the perfect stage of ripeness. I would have been able to demonstrate that better if the husk had stayed on when I picked it. Unfortunately, it stayed on the plant. You can see the difference in the purple color of the part that was exposed to the sun versus the part that was hidden under the husks. 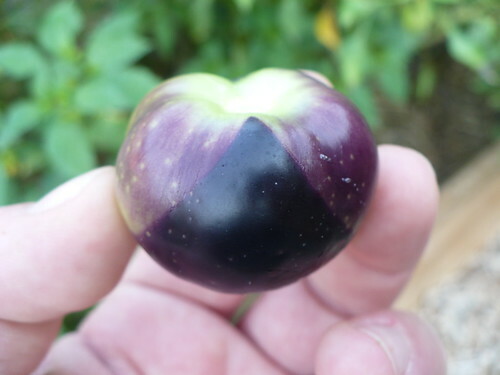 Sticking with the purple theme, here’s our first ripe ‘Indigo Rose’ tomato. The purple coloration has been evident for a few weeks and also tends to increase with sun exposure. 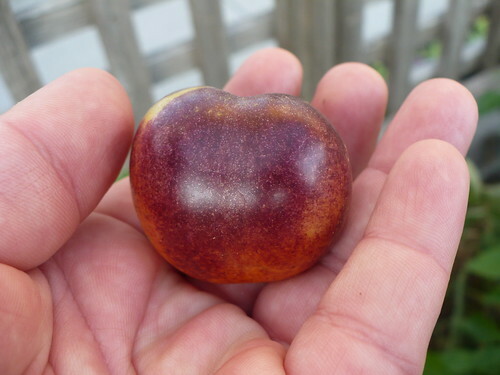 The under color, a rather bright orange shows that it’s ripe. Unfortunately when you mix orange and purple, you tend to get a rather ugly brown color. While unique, these definitely aren’t an attractive tomato. I haven’t tasted one yet, but from what I’ve heard the flavor also isn’t great. This is a look at the unripe ‘Indigo Rose’ tomatoes. You can see the variability in purple coloration. 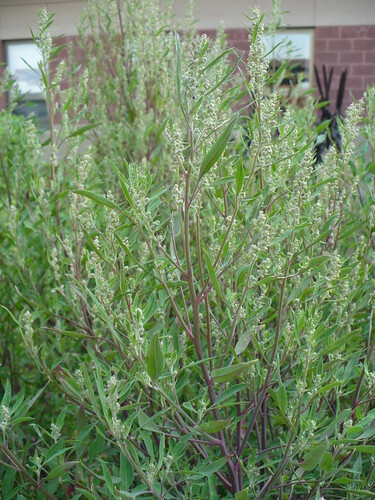 (Also the spider mites on the leaves.) 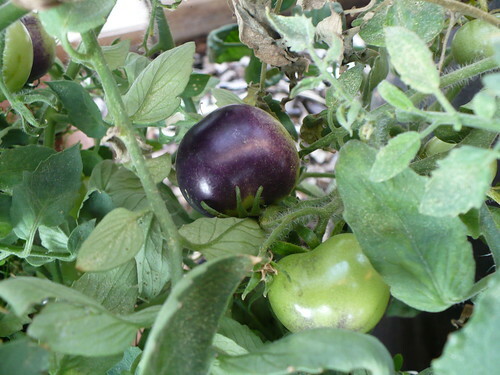 The dark purple one is much prettier, but still unripe and green when you look at the bottom. 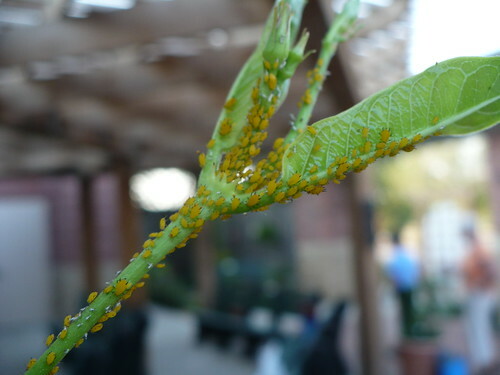 We noticed on Tuesday morning that the mandevilla have these nice bright orange aphids all over them. We borrowed some ladybug larvae from the cucumbers to have a snack. This salvia has been hanging out in the Prairie Star Annual bed all summer and overall looking rather ugly and disgusting. 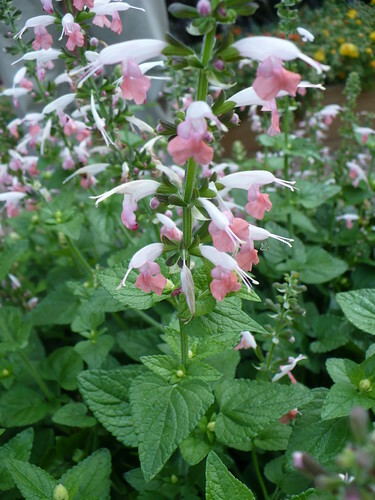 Then, all of a sudden, after a couple weeks of cool weather, it is in full bloom and looks great! Now I have to wonder if it was the weather causing it to look bad or if it just doesn’t bloom well until later in the summer. Posted on August 31, 2012, in PhotoEssays and tagged flowers, insects, mexicangarden, tomatillos, Tomatoes. Bookmark the permalink. 1 Comment. I would love to be a Master Gardener. Word to anyone that is considering. There are more people that apply than they accept. Unless you are retired or do not work full time, you will not be allowed to take the classes. Don’t get your hopes up or save your vacation like I did only to be turned away because you work full time.